What is an Alabama Slammer? 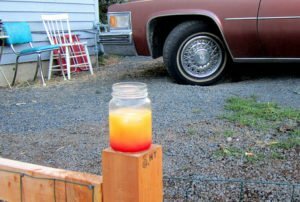 The Alabama Slammer is not a jail in the south, it is an cocktail invented at the University of Alabama way back in 1975. Also known as a the Southern Slammer, this nutty and bourbon flavoured liqueur cocktail is almost concocted as a morning hangover cure… mainly due to the citrus mix. That tangy punch will wake up any tastebuds while shaking a fog from your head. Of course if you’re looking for a liqueur based cocktail with a little coffee kick, maybe a Black Russian can stir you from that funk. We want to make this a 2 oz cocktail. Grab a rocks glass and fill it to the top with ice. Take your two liqueurs and pour them over the ice and into the glass. Add your orange juice, then drizzle half an ounce of Sloe Gin across the top of the drink. As far as shooters go, an Alabama Slammer is one of the best tasting shots out there. This chilled shot is often also made without sloe gin. This will be a shaken shot, just to mix your flavours and juices together with the spirits. Pour the Amaretto, Southern Comfort and sloe gin in a shaker tin over ice. Add the dash of orange juice. Shake vigorously and strain into a shot glass. A single shot is a bit tougher to make. Look at doubling up this recipe… or make 4 at a time! Hey, if you’re making shaken shots, it’s a pretty easy step to adapting the Alabama Slammer into a martini.